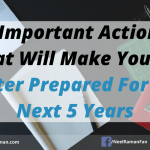 Have you ever met someone who is all excited about something they want to achieve in life, only to find that they’re onto a new thing in a relatively short period of time? It has been said that in order to achieve a dream, we must have a dream in the first place. While some people have lots of dreams, they also easily abandon those dreams for numerous reasons. While on the surface it may not seem like a big deal to give up on a dream and move onto something else, there are some long-term psychological effects that may hinder our future efforts. Make us not trust ourselves as much. Lose trust and respect with others. Lower our motivation to take appropriate action. Make us feel like we’ve failed. Becoming aware of the things that can cause us to abandon our dreams is important if we want to achieve bigger and better dreams in life. 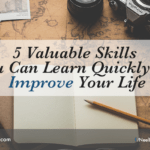 Over the years, as I have continued to develop myself, I have been interested in learning from different teachers from around the world in the areas of personal development, business growth, spirituality and personal performance. 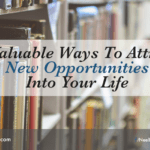 The challenge I’ve faced is that as much as I want to learn from as many people as I can, I’ve allowed my financial situation to determine whether I can learn from a particular teacher or not. As a result, I given up on enrolling in certain programs because of the cost involved. While I’ve tried to justify some of my decisions by telling myself I’m being financially responsible, the truth is I feel like I’ve quit on the opportunity to learn different teachers and grow myself even further. Knowing that I’ve quit on some of my dreams is not a good feeling. Had I been more conscious of the reasons why we quit on our dreams, I may have been able to prevent myself from quitting. Letting slow progress defeat you. It’s rare for everything to go as planned when we’re pursuing a goal or dream. It’s common for people to expect things to go smoothly and if they don’t or when progress is slower than expected, if they don’t have the mental strength to keep going, they will eventually quit. We have to learn to acknowledge our progress and start comparing where we are to where we were. Not being clear on why your dreams are important to you. Having clarity on why a dream is important to us is a critical starting point. As we start experiencing challenges on our way to achieving our dreams, if we have a strong motivation as to why we want to achieve those dreams, we have a much better chance of continuing on our journey. Not willing to do the work to achieve your dreams. If we want a new reality, we have to be willing to do new things or do things differently. This may include gaining new knowledge, developing new skills, asking for help or taking new action. We have to be willing to do what’s necessary to achieve our dreams. Comparing yourself to others. Comparison is a habit that destroys confidence and makes us less willing to continue going for our dreams. The truth is some people may appear to be more skilled, more knowledgeable and more confident than us, however that should not be a reason for us to give up on our dreams. Having clear reasons as to why our dreams are important to us will help us overcome the comparison urge and stay committed to what we need to do. Not believing in your dreams. If we don’t believe in our dreams, then it’s highly unlikely anyone else will believe in our dreams. Sometimes we have to develop the belief in ourselves by working with different coaches or mentors, who can inspire us to think beyond our current reality. As our belief strengthens, we will start taking new actions, which will build momentum and keep us going. Having dreams makes our lives exciting, meaningful and fulfilling. If we are not aware of things that can make us quit our dreams, there is a greater chance we will look for reasons to give up on them when things get challenging. 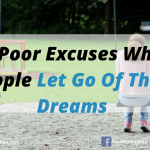 If we can avoid these reasons, we dramatically increase our chances of actually achieving our dreams. Action Step: Reflect back on the last dream you gave up on. Go through the list above and identify what were the reasons why you quit. Use that awareness to help you stick with your dreams in the future. 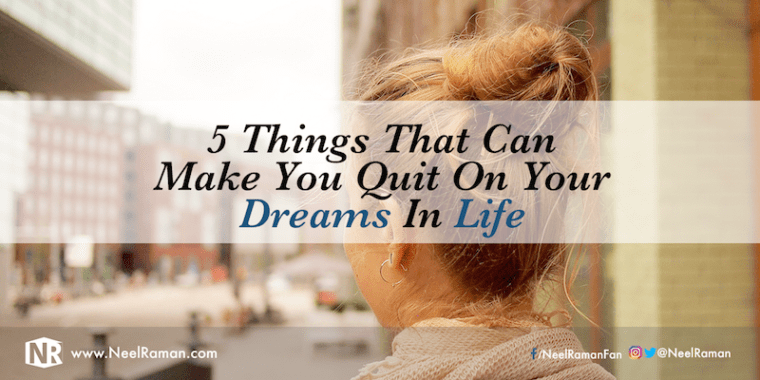 Question: What could be another reason why people quit their dreams?